The Estorick Collection is to be congratulated on a magnificent display of Classic Italian Film Posters. It provides a wonderful opportunity to see the great flourishing of the Neo-Realist movement and its aftermath through posters from the Italian cinema. 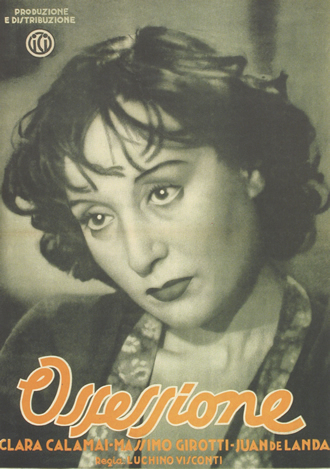 Obsession (1942), Luchino Visconti’s gritty portrayal of lust, adultery and murder set against the endemic poverty and unemployment of Mussolini’s fascist Italy, was the ground-breaking precursor to Neo-Realism in the cinema. Ironically, it was produced by the film studio headed by Vittorio Mussolini, the dictator’s son. 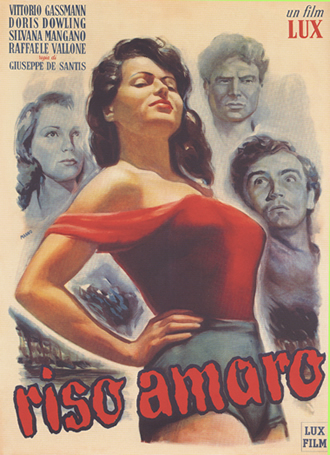 In complete contrast to the highly-censored films produced by the Fascists, which usually depicted a life of wealth and leisure alien to most Italians (known derisorily as “White Telephone” movies because of their inevitable deployment, usually in the bedroom), Visconti’s movie used all of the attributes which came to distinguish Neo-Realism. Needless to say, the authorities hated the movie and did their best to destroy it. The Neo-Realist movement – which was also represented in the writings of Cesare Pavese and Italo Calvino – emerged from the dying embers of the fascist regime. It gave voice to the Resistance, which could have taken power, but didn’t. The films portrayed working people facing the real predicaments of the times, shot on location and in the streets, casting unknown actors and local workers. The first film of this genre was made in 1945 by Roberto Rossellini. Rome Open City tells the story of Manfredo, a communist leader of the Resistance and Don Pietro, a priest who helps the Resistance. They are hunted by the Gestapo and betrayed by Manfredo’s drug-addicted mistress. Despite torture, they reveal nothing and are executed. Don Pietro’s last words are: “It’s not difficult to die well. The difficult thing is to live right”. It was thus the first identification in the cinema of Italians fighting against Fascism. At their best, Neo-Realist films not only raised and analysed social concerns or injustice, but posed solutions which would emphasise working class solidarity and collective ideals. Visconti’s second film La Terra Trema (The Earth Trembles, 1948) and Giuseppe De Santis’ Riso Amaro (Bitter Rice, 1949), best exemplify this. 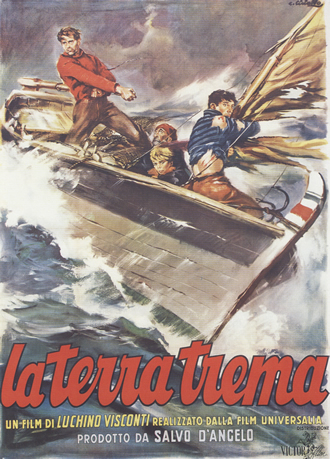 La Terra Trema follows the life of a poor Sicilian fishing family who struggle to break free from the exploitation of the wholesalers who control the fishermen’s lives. They try to involve the whole community, but out of fear are left to fend for themselves. When their boat capsizes in a storm they are bankrupted and evicted from their home. Visconti thus leaves the story open-ended, showing that there has to be a revolutionary change to achieve anything. Riso Amaro drew its inspiration from the experience of the thousands of women and girls who flocked to the rice fields to work under miserable conditions for a pitiful seasonal wage and a sack of rice. It shows the fight between the mondine and the clandestine (the regulars and the non-union women), before their reconciliation in a united front against their overseers. There is a highly-charged eroticism in the film condemned by both the Catholic church and the Italian Communist Party (PCI). This did not stop cinemagoers flocking to see it, and it gained fifth place in the box office for the year. 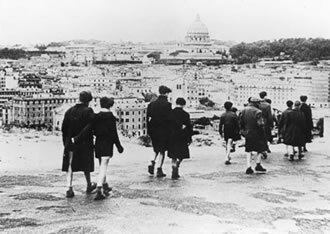 The movement’s decline can be seen in the way communal solidarity loses its emphasis, to leave isolated individuals having to face injustice alone, as in Vittorio De Sica’s Bicycle Thieves and the last Neo-Realist film Umberto D.
Most commentators emphasise the hostility of both the Vatican and the government. The Church tried to discourage the faithful by posting lists of banned films outside the churches – this would often have the opposite effect, because some cinemagoers would use these lists as a recommendation! They would also ban films from those cinemas under their control (by the mid 1950’s the Church ran one-third of all cinemas). The government used the weapon of censorship, denied them funds and export licences. Another factor was the dumping of a huge backlog of Hollywood films on the market, a condition for receiving Marshall aid. One of the claims by the “left” – that the directors had betrayed the movement – must be refuted. This is a smoke screen to disguise the very real betrayal of the PCI. From the moment Togliatti (the leader of the PCI) landed back in Italy in 1944, the PCI started the long road of compromise and collaboration beginning with the Christian Democrats and Monarchists. They then forced the Resistance to disarm, allowed Fascists to continue in their positions as judges, teachers, mayors and police and finally bowed down to the Vatican. The PCI rationalised to its increasingly bewildered and angry followers that these compromises would secure its legitimacy and transform itself into a leading party of government. In fact the opposite occurred, allowing the previously discredited order to regain power. This was not a “mistake” by the PCI but the working out of the Stalinist doctrine of “socialism in a single country” whereby Stalin had ceded Italy and the rest of western Europe to the US sphere of influence. Just as the resistance to Fascism was the inspiration on which Neo-Realism was founded, its decline was a reflection of the despair at the disintegration of the progressive forces in Italy, betrayed by the PCI. However, the concerns of the movement still had a major effect on the next generation of directors, such as Fellini and Antonioni, as this show so well demonstrates. I have tried to show the political background to this influential movement in the history of world cinema. The posters themselves capture the times with an amazing immediacy yet show how much our current cinema is indebted to them.